Ever since biblical times, many victims of Vespidae stinging are recorded every year, not only in Israel but all over the world. In most cases, local tissue injury and/or generalized systemic reactions have been reported. 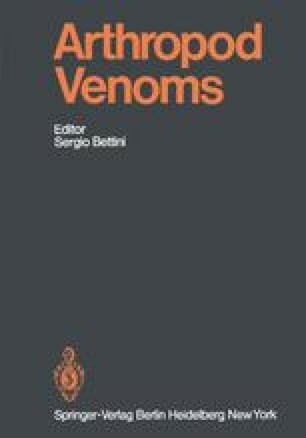 Fragmentary information concerning morphology, social habits of Vespidae, as well as composition and mode of action of their venoms have frequently made the provision of adequate treatment difficult. Confusion often occurs and diagnosis of Vespidae sting has been attributed to other arthropods. “I will send hornets before thee which shall drive out the Hivite, the Canaanite, and the Hittite before thee” (Exodus 23:28). In this review “V.v.” will be used as an abbreviation for venoms of Vespidae. The literature has been surveyed up to August 1976.